Moldy bread may not be what you would consider for lunch, but for some people — young college students and the homeless — it is an option, according to CNN Health. Eating moldy foods, including bread, can be dangerous because you could be eating mycotoxins, or fungal poisons. Some types of mold can cause food poisoning, which can make you ill and result in stomach cramps, fever, diarrhea, vomiting and nausea. There is no guarantee that only one particular chain or type of mold grows on bread. Jackson Kung'u, a microbiologist from the Mycological Society of America, notes multiple cases where humans have eaten moldy bread and either became ill or died from doing so. Depending on the type of mold growing on the bread, it could contain gangrenous ergotisms, alimentary toxic aleukia, Stachybotrys chartarum or aflatoxicosis. These are just a few examples of the types of bacterium or fungi that can grow on bread. Of course, this does not mean that every mold is harmful. Penicillium camembertii and Penicillium roquefortii, fusarium venenatum, aspergillus oryzae and other types of mold are used as food cultures for some foods, such as cheeses, and are harmless. By the time you see mold on the bread, the mold isn't just isolated to the area that you can visibly see. 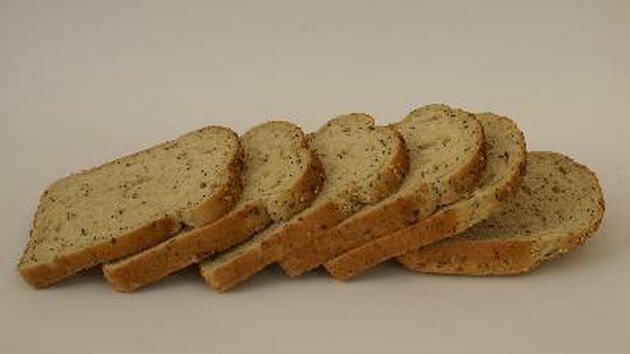 Kung'u says that bread is porous and by the time you see mold on your bread, it is highly likely that the entire piece, or loaf, is contaminated with the mold. There has to be a high number of mold spores present for mold to be visible. Mold tends to grow in warm, dark areas or where the area has a lot of moisture. Depending on the type of mold growing on the bread, you may develop food poisoning or a dangerous food-borne disease. Some of these food-borne illnesses, such as salmonella, can be treated and cured, while others, such as Stachybotrys chartarum, can cause irritation of your mouth, nose and throat and lead to shock, hemorrhage, dermal necrosis and death. Avoid eating any foods that pose a potential risk or threat to your health. Avoid eating foods that appear to have mold on them or are older than their expiration dates. While not all mold is harmful, it's better to not take the chance. Can a Food Allergy Cause Scalp Folliculitis? What Happens if You Eat Fungi?